This week marks the annual launch of the Support at Home campaign, made possible by The Coffee Bean & Tea Leaf® and Operation Homefront, a national nonprofit that builds strong, stable, and secure military families so they can thrive in the communities they have worked so hard to protect. Beginning Monday, May 23 - Sunday, July 10, 2016, a contribution of $1 will be donated to Operation Homefront - for every special 12 oz. Support at Home Ground Coffee ($9.99) or 20-count tea bag Support at Home Tea Tin ($8.99) sold in store and online. The Coffee Bean & Tea Leaf® has once again created 2 special edition coffee and tea blends that will be available in store and online while supplies last. Support At Home Coffee, a dark and distinctive blend, combines Sumatra and Brazil coffee beans for a bold yet smooth flavor. Boasting chocolate aromas, hints of sweet peach and deep wood flavors, the Support At Home Tea Tin consists of 100% Ceylon black tea leaves selectively picked by hand from the Bogawantalawa Estate in Sri Lanka. Guests also have the option to purchase Support at Home retail coffee and tea products for donation to military families throughout the U.S. Each coffee bag and tea tin contains a blank label, which can be used to add a touch of personalization to each product. Lipton is encouraging people to pull up a chair and reconnect with friends and family in a meaningful way through Lipton's Chef Fest, a series of experiential dining events designed to infuse excitement into everyday meals. Lipton's Chef Fest events, which will be hosted by celebrity chef Michael Symon and feature appearances from other celebrity friends, will coincide with new recipes and digital content via a multi-platform, culinary-focused partnership with Food Network, leveraging the brand's digital assets. The focus on mealtime comes from Lipton's belief that the difference between an ordinary meal and a great meal is the combination of the right ingredients and moments around the table with friends and family. "Today's world can be hectic and impersonal, making it easy for us to miss out on what really matters," said Melanie Watts, director of marketing for Lipton. "At Lipton, we know that refreshing iced tea goes great with meals and is the perfect complement to great times around the table. That's why this summer and fall, we are using this inspiration to help people create great mealtime moments." Lipton's Chef Fest events will kick off this fall in Chicago, Washington D.C., Austin, Texas, and Atlanta and will feature celebrity guests, local tastemakers, mixologists, live music and delicious meals paired with Lipton Iced Tea. Michael Symon will host each event. Additional celebrity guests, to be announced separately, will also join the events. "There's nothing I love more than the stories and traditions that come from gathering with friends and family for delicious food and a lot of laughs. That's why I'm so excited to be a part of Lipton's Chef Fest," said Symon. "We hope that these events will help people pause, take a break and really savor those important mealtime moments." The events align with Lipton's brand philosophy, which encourages people to take time to engage with others and enjoy the world around them. With Lipton Iced Tea, people can unlock experiences, creativity and inspiration, whether it's playtime, mealtime, travel time or anytime in between. All summer long, people can enter for a chance to win a trip to one of the four dining stops by posting a photo of their favorite meal and Lipton combination and tagging @Lipton with #LiptonChefSweeps on Twitter, Facebook or Instagram. People can also visit LiptonBrightBites.com, hosted in partnership with Food Network, for recipes from Symon and a new content series starring him and other celebrity guests. "At Food Network, we know that great things can happen when people come together over a great meal," said Deb Puchalla, vice president, content development and digital advertising. "This partnership will bring inspiring food-forward content to new audiences across the country." NO PURCHASE NECESSARY. Lipton's Chef Fest Sweepstakes is open only to legal residents of the 50 United States (or DC) who are at least 18 years old (19 in AL or NE) at the time of entry. Sweepstakes starts on May 18, 2016 at 12:00 a.m. ET and ends August 25, 2016 at 11:59 p.m. ET. For FREE ENTRY and Official Rules visit www.TheChefFest.com. Void where prohibited. Sponsored by Pepsi/Lipton Tea Partnership, 1111 Westchester Avenue, White Plains, NY 10604. It's cool, refreshing, good for you, and so popular that an entire month has been set aside to celebrate…Summer is here and so is National Iced Tea Month. 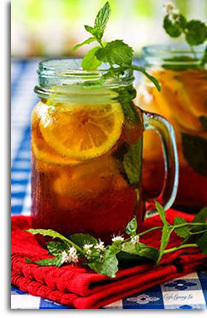 June’s National Iced Tea Month is a good time to drink up the many benefits of tea. It’s tasty, refreshing, has zero calories and is chock full of health benefits, so it’s a terrific beverage choice. With a multitude of research suggesting that the substances in tea may help the body maintain healthy cells and tissues, contribute to heart health and keep your weight in check, why would anyone choose to drink anything else? According to the Tea Association of the USA, approximately 85% of tea consumed in America is iced and over the last ten years, Ready-To-Drink Tea (RTD) has grown more than 15 fold. In 2014, Ready-To-Drink sales were conservatively estimated to be more than $5.56 billion. On Wednesday, June 1, your daily Tim Hortons coffee purchase will help change thousands of lives. One hundred percent of coffee sales at participating Restaurants on Tim Hortons Camp Day will be donated to the Tim Horton Children's Foundation (THCF) and help provide more than 19,000 kids from low-income families across North America with an experience that builds essential life skills and makes their futures brighter. "Camp Day makes a positive impact on the lives and futures of thousands of kids from communities across North America every year, and we couldn't be more proud to continue supporting such an important initiative," says Felipe Athayde, President, Tim Hortons US. "We're grateful to our Guests and Restaurant Owners who help give kids the experience of a lifetime and the opportunity to develop skills that will support them to become more responsible, caring and motivated individuals." Last year alone, $12.4 million was raised in Canada and the United States, allowing close to 18,000 kids from low-income families to spend a life-changing session at one of the seven THCF camps. With the funds raised on Camp Day, Tim Hortons Restaurant Owners sponsor kids directly from their local communities to attend camp. They work closely with local youth organizations and schools to identify kids who would benefit most from the experience. "We help kids unlock their hidden strengths, and develop critical life skills that will support them in finding their own success and thrive as contributing members of their communities," says Dave Newnham, President and Executive Director, Tim Horton Children's Foundation. "Our camps aren't just a fun visit away from home, these intentional experiences can be the catalyst to change their outlook on life and gain greater confidence about their future." According to the National Center for Children in Poverty, more than 16 million children in the United States live in homes below the federal poverty rate*. The THCF strives to address the cultural roots of poverty; the idea that individuals who are economically disadvantaged often develop a set of institutions, values, norms and behaviors which perpetuate rather than counter poverty. Camp programs are designed to provide children and youth with opportunities to develop skills and values that help set them on a different path in life. "My experience with the Tim Horton Children's Foundation taught me the importance of working together as a team and asking for help when I need it," says Debra Turnboe, Youth Leadership Program alumni from the Detroit, Michigan area. "I will always remember the wise words of one of my counselors during my second year in the program, who said that no matter how hard your situation might be, it won't last forever and you can get through it." In addition to summer programs, THCF camps operate programming throughout the year, welcoming schools and organizations that serve low-income communities to participate in free-of-cost camp experiences. At camp, kids participate in a wide range of purposeful programs and activities designed to build self-confidence, self-esteem and leadership skills. The THCF also offers a unique Youth Leadership Program, which takes place over five summers and focuses on building lifelong leadership skills, teamwork and independence. Graduates of the Youth Leadership Program are eligible for financial support through the Carolee House Bursary Program to attend post-secondary education. Since 2002, more than $6 million in bursaries have been distributed to students pursuing university, college or a trade certificate program. To showcase the benefits of Camp Day, Tim Hortons launched an exciting new red cup design. These cups feature speech bubbles that showcase the impact of what buying a cup of coffee can have on kids' experience at camp including: helping kids believe in themselves, helping to create a brighter future, helping to build courage and confidence, and helping kids to be their best. This year, Guests who want to help to raise awareness about Camp Day can also purchase a red Camp Day bracelet at participating Restaurants. Camp Day bracelets are $2 plus tax while supplies last. Guests are invited to wear the bracelets in support of the Tim Horton Children's Foundation. Guests can also make a donation any time at timscampday.com. Every Camp Day donation counts. Penton's North American Tea Championship (NATC), the only independent and professionally-judged tea competition in North America, presented 11 first-place wins to the best, premium iced teas in various categories, as well as Best Packaging and Best Value awards --- just in time for National Iced Tea Month in June. The evaluation was held May 12 - 13 in Montebello, Calif. at the Wilbur Curtis headquarters, and all of the high-quality winning teas are commercially available in the marketplace. Visit TeaChampionship.com. Kevin Sardino, Starbucks' product development manager, beverage R&D, tea, in Seattle, Wash., and an NATC evaluator for the Iced Tea Class, said, "As a long-time tea enthusiast, I'm delighted and honored to be able to contribute to a competition like the North American Tea Championship. The sheer number of entries in the Iced Tea category is a testament to the popularity of the segment. The panel of judges came to a unanimous consensus on nearly every winner, leaving little room for the question of subjectivity in those products' quality." Honorees will be featured at the North American Tea Championship Winners Tasting Circle at World Tea Expo (WorldTeaExpo.com), June 15 - 17, 2016 at the Las Vegas Convention Center (#WorldTeaExpo and #WTE16). A complete list of the winners, including second and third-place teas, is available at the North American Tea Championship website: TeaChampionship.com. Scott Svihula, an NATC Iced Tea Class evaluator and principal of Hula Consulting in Juno Beach, Fla., noted, "This year's NATC submissions offered an array of profiles and flavors, some of which were pleasantly surprising. Categories like Bag-in-Box [BIB] and Instant, that are not normally associated with a quality iced tea beverage, were delightfully good. However, one of my favorite categories, fresh brewed herbal iced teas, was very underwhelming; a category that offers such promise and with such an array of ingredients should provide an enticing flavor profile. Several categories were very competitive, like Foodservice Unflavored Black and Foodservice Flavored Black; oftentimes subtle differences separated the winners." NATC Evaluator Sardino said, "Many of the submissions exceeded expectations, especially in light of some of the format's potential limitations. But, there were also those that fell short. To them, I would say, understanding your components --- whether teas or botanicals --- and how they work together, is the key to separating your product from the pack. Become the master of your toolbox! And, always taste the competition. As one improves, the bar is raised for the rest. The NATC is an ideal platform for gauging how hard you'll need to work to get to the top, or to stay there." Steve Schwartz, CEO of Art of Tea in Los Angeles, Calif., an NATC evaluator, shared, "It's wonderful to see a collaboration of likeminded companies come together and put out their best work for open feedback. This is how we all rise as an industry and get better. There is no more room for good, only great. Iced tea continues to be a meaningful space to play in, and now is the time to excel with quality sourcing and key ingredients." Svihula added, "I congratulate all the winners in this year's NATC, and I urge all World Tea Expo attendees to take part in this year's NATC Winner's Tasting Circle at the event in June, to see for themselves." All NATC tea submissions were evaluated blind and through organoleptic analysis of the following characteristics: flavor, body, color and clarity. An overall numerical value on a 100-point scale was then calculated based on the ratings of each characteristic. Winners were determined by rank. Judges evaluating the teas were not allowed to enter teas from their own company.